Hello again and welcome to CONNECT, it’s March and it’s a busy month, it’s nearly time for our Connect Kerry Hair and Beauty Awards. We are so looking forward to welcoming all our finalists their families and friends to the Rose Hotel on March 11th. Last year was an amazing day and we think this year will be just as good if not better. Why do we do it? Simply to recognise those in the industry who work tirelessly day after day to make us all look and feel good. Don’t miss next month’s issue to get all the news of the day, or check out our FB page on the day where we will have live updates. 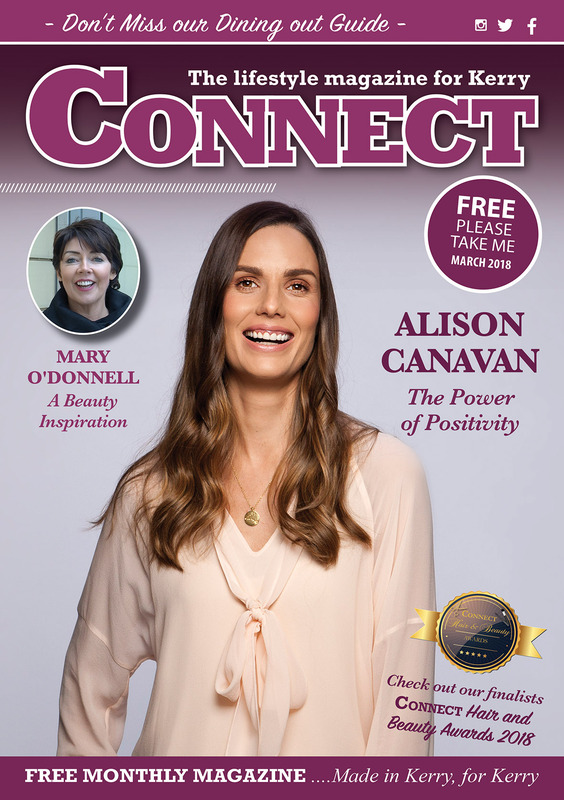 Our cover story this month takes us to meet the lovely Alison Canavan, model, mum author and health and wellness coach. Reading all about her will certainly make you rethink your own life and pick out what’s important. We chat with Mary O’Donnell, last year’s life time achievement winner at the hair and beauty awards, and what a shock she got! Mary was a judge at the event last year, the judges have a say in the overall voting each category and they help me choose the honorary awards but the one award of the event I have total say over is the lifetime achievement so when the judges asked me last year had I made a decision, I said a simple yes, I couldn’t discuss any further as Mary would have guessed, but I do think she got a surprise on the day and a very well deserved accolade to the lady who has done so much for the industry in the county and beyond. With Mother’s Day, St Patricks Day and Easter all in the mix over the coming weeks we check out dining in Kerry there is so much choice so why not treat yourself. It’s also time to invite you to nominate who you feel would be worthy of one of our awards in the Annual Connect Kerry Women in Business Awards, now in its 4th year it’s time to recognise those ladies who work so hard on a daily basis to do it all, if you feel you deserve to be part of this annual event or know someone you think is worthy of this do please contact us and we will feature her.